Indomitable | The online home of Chauncey DeVega: The Jim and Jane Crow American Apartheid "Greatest Generation": How Would You Caption This Photo of Levittown, New York from the 1940s? The Jim and Jane Crow American Apartheid "Greatest Generation": How Would You Caption This Photo of Levittown, New York from the 1940s? How would you caption this photo of Levittown, New York? It was one of the most racist communities in the country, and a model for the racial suburbanization of the United States. How would you accurately speak to its history and power? It is nice to see that discussions of the black/white wealth gap are now circulating in the social ether. Now, the conversation needs to be broadened to include how racial inequality has damaged the net economy by not just leveraging white gains against blacks, but against people of color more generally. Social scientists and others have been talking about the racialized (and gendered) nature of wealth and income allocation in the United States for several decades (at least). As such, I would imagine for senior scholars who have been working on these issues in a sustained way, to have the mass media catching up is a nice complement, while also being an opportunity to say "I told you so." The next move in this conversation is challenging the myth of meritocracy and American exceptionalism embodied by "The Greatest Generation." The label itself is a Spielberg-Hollywood creation which is a reflection of a moment at the end of The Cold War when America stood triumphant. As a hyper-power, she had to reimagine her past and give a sense of destiny to her triumphs and struggles in the 20th century. World War 2 was an obvious way of doing this. The Greatest Generation narrative is also a racial one. Language is important here. The victors of Normandy and the Pacific are almost always framed in the "mainstream" popular imagination as both white and male. Black and brown veterans have to be read back into the narrative as a corrective. To the White Gaze, and its nostalgia, great warriors such as the Tuskegee Airmen, the 442nd Regimental Combat Team, and the Montford Point Marines are asterisks to a broader story, one which does the political work of contemporary colorblind multiculturalism and "postracial" America. And even then there are limits: see the white racial resentment ginned up in response to the quite fair critique that Saving Private Ryan was a literal "white washing" of actual events. Systems of wealth and income inequality in the service of white supremacy matured in the post-World War 2 era with the G.I. Bill and the FHA and VA home loan programs. Tens of millions of veterans and their families could take advantage of these wealth transferal programs. Black soldiers, and other people of color, were systematically denied access to this massive inter-generational transfer of wealth and income. The Greatest Generation was complicit in this process. The white veterans who took monies and resources denied to their fellow citizens were passive cosigners. Those who actively went out and redlined, bullied, and harassed their non-white neighbors in order to maintain the "purity" of their communities were active supporters of American Apartheid. Some of the Greatest Generation fought back against the evils of Jim and Jane Crow. Most, like their fellow Americans, were just free riders and bystanders to history. Opting out does not free a person of complicity. The Atlantic has a great photo retrospective on the end of World War 2. The story contains an image of Levittown, New York. Levittown was one of the country's first planned suburban communities. It was also an ideal-typical example of how American Apartheid was created in suburbia. Non-whites, and other ethnic "undesirables" were explicitly prohibited from living in Levittown. These rules would be in place in similar communities all across America where they would be enforced by physical violence in the public sphere, and also by the law in the form of restrictive housing covenants. 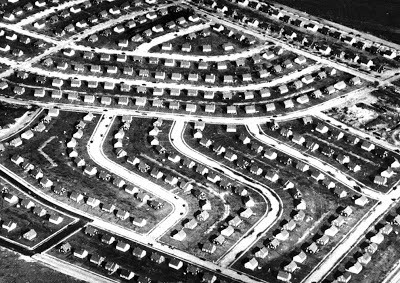 Of course, the Atlantic's caption of the Levittown photo contains no such information. Images of the past when viewed in the present are a representation of reality. These realities tell us just as much about our present concerns as they do about the supposed "facts" of the past. We cannot begin to fix the racial wealth gap until the American people are forced to think systemically about how racial and wealth inequality has deep roots in the founding, the frontier, urbanization, and most importantly, the post World War 2 era. The American people, white folks in particular, are utterly ahistorical in their identities. As such, this will be a difficult conversation. It must still occur. I learn something new every time i come to this blog. I had always associated white flight with the eradication of Jim Crow but I see the seeds were planted some years prior. That whole "greatest generation" crap is vomit inducing for me as well. Just another chance for white folks to pat themselves on the back while blackness and it's contributions and achievements are absent in the white gaze. In my neck off the woods there is a saying..."the suburbs killed Milwaukee". Your thoughts help frame this embarrassment in my mind. I learn from you. I ask hard questions. We have each others' backs. Great video. New Urbanism, huh? I can see it. Coincidence that there is an uptick in Emergency Managers in places like Detroit? Maybe. But it sure would be freakish if Detroit was white again and blacks were relocated to the remote suburbs. Oh, if Kansas City is any indication, that's definitely coming. The downtown area and inner loop has been rehabilitated and recolonized, the 3rd and 5th districts are overwhelmingly owned by outsiders in large tracts, so that the residents are by-and-large just renters, and now the school district is about to be subject to a state takeover. The displacement you mention above is indisputably a work in progress on a very massive scale.